Context: Persistence of pain will be the cause of the disorder in the process of recovery, sleep, and reduced life quality of patients; therefore, pain management is important in this respect. Aims: This study aimed to compare the nurses' and patients' views about barriers to pain management. Settings and Design: This cross-sectional descriptive-analytic study was conducted in teaching hospitals affiliated to the Shoushtar Faculty of Medical Sciences in 2017. Materials and Methods: Thirty nurses from the surgery department were selected by the census method and 150 patients were selected in the quotas. The data collection tool was a researcher-made questionnaire consisting of two sections: demographic information and four areas of barriers (organization, nurse, patient, and physician). Statistical Analysis Used: Data were analyzed using descriptive statistics, Chi-square test, Tukey's test, and t-test using SPSS-16. Results: The mean age of the participants (31.3 ± 7.3) and the mean score of the pain management barrier questionnaire were obtained from the patients' view (109.97 ± 16.65) and nurses' view (106.88 ± 13.96). In the nurses' group, there was a significant relationship between work experience and employment status with pain management barriers (P < 0.05). Furthermore, there was no significant difference in the nurses' and patients' view about the pain management barriers (P > 0.05). Conclusion: Due to the high percentage of patient-related barriers in the present study, it is essential to recognize these obstacles and to overcome them, and the importance of providing information to patients as part of the management of pain control is emphasized. According to the International Association for the Study of Pain, pain is recognized as an unpleasant sensation and emotional experience associated with acute or potential tissue damage that can, in addition to protecting and stimulating aspects, alert an individual to an obvious or hidden injury., Pain is a stressful event that can affect a person's lifestyle, satisfaction, and comfort, causing imbalance, fatigue, impairment in the life quality, sexual activity, personal relationships, sleep, and daily activities of the individual. Pain control is an important part of the health-care process, so the American Pain Society has identified it as the fifth vital sign. In order to reduce complications caused by pain, effective pain management, known as one of the branches of medical sciences, can reduce patients' pain and suffering and improve their life quality. Effective management consists of predicting processes of decision-making that develop through knowledge of pain and its control. Given that pain relief is considered as the main core of nursing care, the importance of providing this role by nurses, as those who play a key role in pain management, is seen more than ever., Nurses also spend more time with patients than with other health-care providers and they always need to make decisions about measuring and controlling pain, especially in patients admitted to surgical wards. Research has shown that patients in the surgical wards experience about 80%–85% of mild-to-moderate pain and complain about their pain., Since pain relief methods are done in two invasive and noninvasive ways, nurses should choose and use the most effective method in order to determine the best pain relief method according to the patient's physical, emotional, and cultural conditions. Gaikwad et al. 's study indicated that pain control from a patient's perspective shows the treatment team's success and the medical service quality. Therefore, management and relief of pain are very important because an imperfect cycle of pain control ultimately leads to patient's distrust and uncertainty in the team's ability and motivation to relieve pain. Patients' viewpoints on pain management are also important indicators for comparing the performance of hospitals, which can be considered as the nurses' sensitivity to control pain in patients. On the other hand, sharing the expectations and responsibilities of the patient and the nurse with a management plan can improve the treatment outcomes and benefits. In the area of nursing barriers, inadequate knowledge and skills regarding the use of dermatology drugs, attitudes such as being addictive pain relievers and pretending to have pain by the patient, lack of treatment, absence of nurse communication with the doctor, time-consuming nonpharmacological methods for pain, and differences in culture and languages can be pointed out., Providing this specialty in the nursing field leads to their professional autonomy and pain management, which is one of the most important moral and patient priorities. Research has shown that few studies have been conducted on patients' viewpoints on pain control, while paying attention to this view would lead patients to participate in health and reduce economic burden for them and the society. In addition, Sawhney and Sawyer suggested that nurses' knowledge of pain management can have a positive effect on controlling and relieving pain in patients. Considering the importance of the issue of pain management in health care and the importance of this in nursing activities, attention to this view can help nurses in promoting the role of care and effective management of pain in patients. In addition, achieving patients' perspective in order to eliminate barriers to pain management can be an important step in controlling and relieving pain, in addition to finding deficiencies in the service. Therefore, the aim of this study was to compare nurses' viewpoints with pain management barriers. 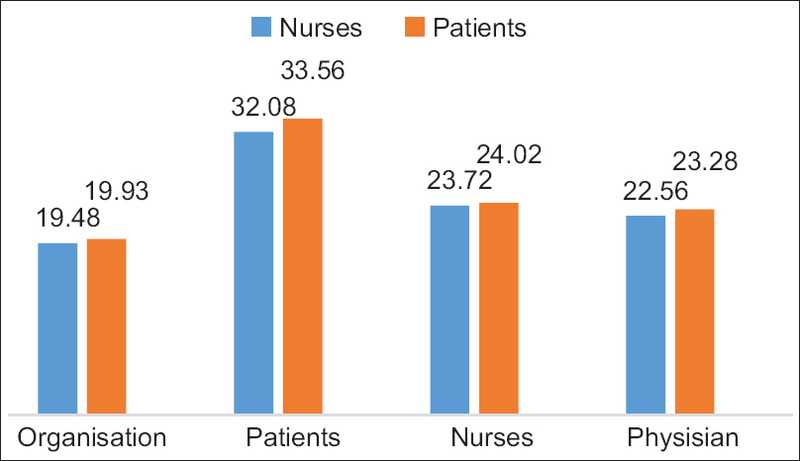 In this cross-sectional descriptive-analytic study conducted in teaching hospitals affiliated to the Shushtar Faculty of Medical Sciences in 2017, the study population was all patients admitted to the surgical wards of Alhadi and Khatam Al-Anbiya Hospitals in Shushtar as well as nurses working in these two wards. In this study, 50 nurses were selected using the census method and 150 patients by quota sampling in proportion to the number of nurses participating in the study within 3 months according to the sample size formula. For patients: The signed written consent, age from 20 to 40 years, receiving work services in at least three different shifts, and absence of any physical-psychological dependence on various types of opiates, painkillers, and psychedelic substances; for nurses: The signed written consent and at least 3-month work experience. Failure to complete a questionnaire. The data collection tool was a researcher-made questionnaire consisting of two parts. The first part of the questionnaire was a demographic information form for patients (including age, gender, education level, and occupation) and nurses (including age, gender, marital status, work record, and employment status). The second part of the questionnaire was related to barriers to pain management from nurses' and patients' viewpoint. This questionnaire contains forty questions about the barriers to pain management, which is a four-statement Likert scale: “I totally disagree with” (Score 1), “I disagree” (Score 2), “I agree” (Score 3), and “I totally agree” (Score 4) in four areas (patient, nursing, physician, and organization). Finally, there are three open questions regarding the relationship between doctor, nurse, and patient (in the form of totally, somewhat, and at all). The content validity method was used to determine the tool validity. The questionnaires were distributed among ten faculty members related to the study topic, Shushtar Nursing and Midwifery School, so that content, clarity, and simplicity of each of the tool statements were judged and reviewed after applying corrective comments. Internal consistency (Cronbach's alpha) was used to determine the reliability. For this purpose, the questionnaires were provided to twenty patients and ten nurses who had the sample characteristics and they were excluded from the study. Finally, the Cronbach's alpha coefficient for this questionnaire was 0.83. In order to observe the moral considerations, informed written consent was obtained from the participants. With the permission and coordination required by the vice-chancellor of the Jundishapur University of Ahvaz and in coordination with the Shushtar Faculty of Medical Sciences and with the letter introduction of the research, the researchers referred to the General Surgery Department of Khatam-ol-Anbia Hospital and the Department of Surgery, Alhadi Women's Hospital in Shoushtar. The researchers made the necessary arrangements. Then, the researchers, while introducing themselves and expressing the purpose of the study, after obtaining the written informed consent forms from the patients, for 3 months in different shifts, provided questionnaires to the patients and nurses who were qualified and satisfied to participate in the research. For those who could not complete the questionnaire and did not have the necessary literacy, the researchers completed the questionnaires in interviews with them. After collecting the data within 3 months by the researcher, the data were analyzed using descriptive statistical methods (median, mean, standard deviation [SD]), t-test, Mann–Whitney test, and Tukey's test in SPSS-16 (SPSS Ins. Released 2007 Spss for Windows, version 160, Chicago). The mean age of the participants in this study was 31.3 ± 7.3 years. In the group, 99 patients (66.6%) were female and 98 (65.3%) were married. In the nurses' group, 50 (90%) were female and 36 (72%) were married. The mean score for pain management barriers in the patient group was 100.79 ± 16.99 and in the nurses' group, it was 97.84 ± 14.78, which was the highest mean in the patient area [Figure 1]. Most of the barriers in each area were related to (1) the organizational area (shortage of personnel, lack of suitable criteria for examining the severity of pain, lack of cooperation between nurses and physicians for pain examination, and inadequate training of personnel in the use of medicinal and nonmedicinal drugs); (2) patient's area (not expressing pain from the patient due to muscular pain and fear of rising hospital costs); (3) nursing area (not giving a pain-relieving drug even with a doctor's order, not recognizing the true pain, and lack of adequate knowledge and time about the use of nonpharmacological methods); and (4) physician area (neglecting a nurse's report and not having enough time to examine pain). Among the factors affecting the pain management barriers, there was a significant relationship only in the nurses' group between work experience and employment status [Table 1]. Furthermore, the Tukey's test showed a significant statistical relationship between the official employment status with the mean (89.08 ± 13.18) (P = 0.017). Qualitative variables were represented by number (percentage) and quantitative variables were represented by mean ± SD. 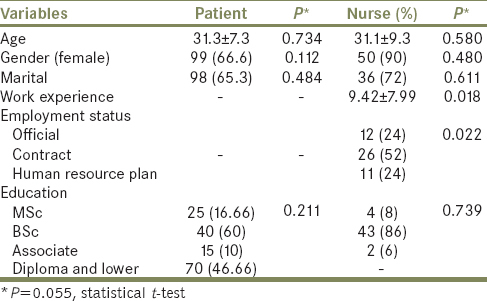 In the context of open questions asked about the relationship between the nurse and the patient, the results showed that 104 (52%) have mentioned this relationship somewhat and 82 (41%) mentioned completely this relationship [Table 2]. There was no significant difference between the two groups in patients' and nurses' viewpoints of the areas of pain management barriers (P > 0.05) [Table 3]. It was also found that 66 physicians (33%) seldom and 74 nurses (37%) sometimes used nonpharmacological pain relief methods. A significant correlation was seen between nurses' and patients' views on nonpharmacological pain relief methods (P < 0.05) [Table 4]. Pain management is very important in improving the quality of life and reducing hospital admission days. In the present study, there were barriers in all the four areas of management, while in the study by Beck et al., most patients had complete or relative satisfaction with their pain management areas. This consistency may be due to the fact that in Garl et al's. study, patients were learned and nonpharmacological pain relief methods have been used with the participation of patient fellows. In this study, most of the obstacles in the field of nurses and patients are related to the patient, which is expressed by not expressing pain by the patient due to muscle pain; this is consistent with the studies by Dehnoalian and Mohammadpour, Penney et al., and Najafi Ghezeljeh et al. In the present study, fear of rising hospital costs has also been one of the most important obstacles in the patient's area. Regeh et al. have shown that one of the methods of pain relief is reassuring behaviors such as regular visits to the patient and immediate attention to pain, which ultimately lead to reduced patient's anxiety and worry; therefore, this is not consistent with the present study. In the area of organization, in terms of obstacles such as the lack of sufficient personnel, the present study is consistent with studies by MohebbiandAzimzadeh and Aziznejadroshan et al. In addition, in terms of lack of training for the use of analgesics, it is consistent with studies by Zargarzadeh and Memarian, Aziznejadroshan et al., and Mohebbi andAzimzadeh. In terms of lack of suitable criteria for examining the intensity of pain, it is consistent with the studies by Aziznejadroshan et al. and Mohebbi andAzimzadeh. Perhaps, the reason for the compatibility of study by Mohebbi andAzimzadeh with the present study is that the low level of nurses' work experience causes poor diagnosis of pain. In Parvisi and Alhani's study, most nurses did not use the pain measure due to inadequate supervision by the authorities; while in the study by Dehnoalian and Mohammadpour, the lack of analgesics was the most important barrier to this area, which is not consistent with this study. In order to eliminate these factors, considering that the health area is one of the priorities of each country and every government, forming pain committees in each hospital and performing tasks such as training patients, nurses, and doctors on pain control, using medicinal relief methods and the provision of adequate equipment, and eliminating personnel shortages in the hospital wards, these barriers can be eliminated. In the present study, in the field of nursing, the most important barriers are the lack of recognition of the actual pain and the lack of a pain-relieving drug to the patient, which is consistent with studies by Aziznejadroshan et al., Dehnoalian and Mohammadpour, and Wang and Tsai and also in terms of failure in the use of nonpharmaceutical pain relief methods, which is consistent with the studies by Regeh et al. and Mohebbi andAzimzadeh. In Parvisi and Alhani's study, 99% of nurses were not trained in relieving pain of their patients during their study, and the lack of retraining courses is one of the reasons for using these methods. In this regard, in Kleiber et al's. study, parental involvement in the child venipuncture has been reported to be very effective in distract, and it is necessary for mothers to be taught the necessary training for the treatment and distraction. Furthermore, in Dehnoalian and Mohammadpour's study, the most important barrier related to a failure in reporting a patient's pain from a nurse to a doctor was mentioned due to the inappropriate treatment of the doctor. Nurses play an important role in evaluating and intervening pain, and correct communication is one of the most important characteristics of primary health-care workers, which increases awareness of patient issues and problems. Moreover, increasing the work experience of nurses in the departments makes them familiar with different types of pain and after diagnosis, increases nursing forces and continuous training in using nonpharmacological methods to patients and their companions. In this study, neglecting the nurses' reports and not having enough time to examine pain as the most important barriers are in the physician's field, which is consistent with Morley et al's. study; perhaps, this consistency is because of the relationship between the physician and the nurse which directly affects the outcome of the treatment, and the need for communication and collaboration between doctors and nurses to achieve shared goals for improving the quality of patient care and control of pain is necessary. In addition, pain management is a teamwork that needs to be done by the treatment staff with proper pain assessment. In the context of the factors affecting the pain management barriers, only in the nurses' group, increased work experience and the type of official employment status have been effective in the control of pain. This suggests that this study is not consistent with Parvisi and Alhani's study; perhaps, the reason for inconsistency with the present study is that in Parvisi and Alhani's study, the majority of nurses were under the human resource plan and with 1-year work experience. Similarly, in Wang and Tsai's study, the level of nursing education is one of the factors, which is not consistent with the present study. Conceivably, this inconsistency is due to the fact that in the present study, most nurses are bachelor and the increased level of education increases awareness of pain control. One of the limitations of this research is the shortage of samples, so it is expected that this restriction will be eliminated by expanding the sampling to private centers with more facilities and staffing. In summary, most of the barriers from patients' and nurses' viewpoints were related to the patient. Therefore, it is suggested that the importance of providing information to patients as part of the importance of pain control is emphasized. In fact, educating patients about the implementation of self-care and nonpharmacological methods can be effective in solving problems associated with nonpharmacological procedures. All authors contributed to this research. This study was financially supported by Shushtar Medical School. In the end, the authors would like to express their gratitude to the vice-chancellor for the research of Ahvaz Jundishapur University of Ahvaz and Shoushtar Medicine School, as well as to the dear and honorable nurses and patients participating in this study. Aziznejadroshan P, Alhani F, Mohammadi E. Challenges and Practical solutions for pain management nursing in pediatric wards. J Babol Univ Med Sci 2015;17:57-64. Ghorbani Moghaddam Z, Jahanpour F, Hajivandi A. Knowledge, attitude and practice of nursing regarding post operative pain management in hospitals affiliated to Bushehr University of Medical Sciences; management. Nurs J Vulnerable 2015;1:32-41. Najafi Ghezeljeh T, Hosseini AF. Attitudinal barriers to effective cancer pain management. J Hayat 2012;18:89-101. Brunner LS. Brunner & Suddarth's Textbook of Medical-Surgical Nursing. 13th ed. North American: Lippincott Williams & Wilkins; 2010. Dehnoalian A, Mohammadpour A. Barriers to pain management: Comparing the viewpoints between physicians and nurses. Anesthesiol Pain 2014;4:49-56. Brennan F, Carr DB, Cousins M. Pain management: A fundamental human right. Anesth Analg 2007;105:205-21. Chung JW, Lui JC. Postoperative pain management: Study of patients' level of pain and satisfaction with health care providers' responsiveness to their reports of pain. Nurs Health Sci 2003;5:13-21. Apfelbaum JL, Chen C, Mehta SS, Gan TJ. Postoperative pain experience: Results from a national survey suggest postoperative pain continues to be undermanaged. Anesth Analg 2003;97:534-40. Pourghaznein T, Sabeghi H, Reihani T. Nurses' opinions toward the consumption of morphine for patient's pain relief. Mod Care J 2011;8:38-44. Gaikwad M, Vanlint S, Moseley GL, Mittinty MN, Stocks N. Understanding patient perspectives on management of their chronic pain-online survey protocol. J Pain Res 2017;10:31-5. Mayer DM, Torma L, Byock I, Norris K. Speaking the language of pain. Am J Nurs 2001;101:44-9. Oshvandi K, Fallahinia G, Naghdi S, Moghimbeygi A, Karkhanei B. Effect of pain management training on knowledge, attitude and pain relief methods of recovery nurses. J Nurs Educ 2017;6:31-40. Idvall E, Ehrenberg A. Nursing documentation of postoperative pain management. J Clin Nurs 2002;11:734-42. Alzghoul BI, Abdullah NA. Pain management practices by nurses: An application of the knowledge, attitude and practices (KAP) model. Glob J Health Sci 2015;8:154-60. Eaton LH, Meins AR, Zeliadt SB, Doorenbos AZ. Using a mixed methods approach to explore factors associated with evidence-based cancer pain management practice among nurses. Appl Nurs Res 2017;37:55-60. Latina R, Mauro L, Mitello L, D'Angelo D, Caputo L, De Marinis MG, et al. Attitude and knowledge of pain management among Italian nurses in hospital settings. Pain Manag Nurs 2015;16:959-67. Czarnecki ML, Simon K, Thompson JJ, Armus CL, Hanson TC, Berg KA, et al. Barriers to pediatric pain management: A nursing perspective. Pain Manag Nurs 2011;12:154-62. Regeh N, Ahmadi F, Mohammadi E, Kazem Nejad A, Anoosheh M. Pain management: Patients' perspective. Iran J Nurs 2008;20:1-20. Bowden VR, Greenberg CS. Pediatric Nursing Procedures. 3rd ed. California: Lippincott Williams & Wilkins; 2012. Sawhney M, Sawyer J. A cross-sectional study of the role of Canadian nurses with a specialty practice in pain management. Acute Pain 2008;10:151-6. Beck SL, Towsley GL, Berry PH, Lindau K, Field RB, Jensen S. Core aspects of satisfaction with pain management: Cancer patients' perspectives. J Pain Symptom Manage 2010;39:100-15. Penney LS, Ritenbaugh C, DeBar LL, Elder C, Deyo RA. Provider and patient perspectives on opioids and alternative treatments for managing chronic pain: A qualitative study. BMC Fam Pract 2017;17:164. Mohebbi P, Azimzadeh R. Barrier of implementing non-pharmacological pain management in children and presented interventions by nurses. J Holist Nurs Midwifery 2014;24:40-8. Zargarzadeh M, Memarian R. Assessing barriers for using of complementary medicine in relieving pain in patients by nurses. Q J Nurs Manage 2013;1:45-53. Parvisi F, Alhani F. Studying the rate of knowledge and using of pain assessment tools in children and complaining the importance of education about it. Iran J Pediatr 2005;15:190. Wang HL, Tsai YF. Nurses' knowledge and barriers regarding pain management in Intensive Care Units. J Clin Nurs 2010;19:3188-96. Kleiber C, Craft-Rosenberg M, Harper DC. Parents as distraction coaches during i.v. insertion: A randomized study. J Pain Symptom Manage 2001;22:851-61.